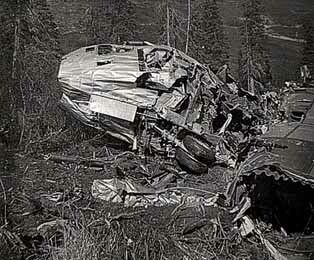 Gene Sanders wrote me in 2006, after he came across certain subjects (C-133, Alaska) on my website. 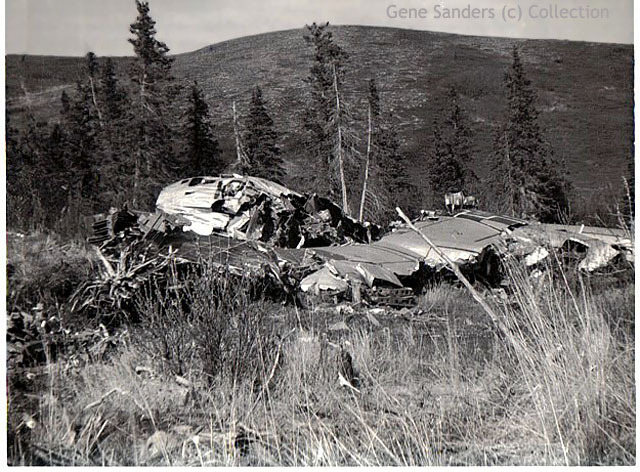 It was interesting to read about the crashes at Sparrevohn, AK where I spent a year in l958-59... At that time there was a wrecked C-119 and a C-47, which had been bulldozed off the runway and were laying under the trees on the east side of the runway. "For your info: there has been a go-around at Sparrevohn from very short final. 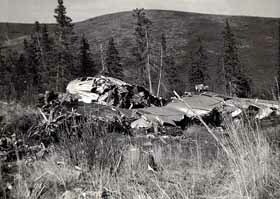 A C-130 did it, back in the 1960s. We had a "not-so-smart" aircraft commander who gave his co-pilot, Jock Schwank, a go-around and he would not let him pull the throttles back... He made it...barely... !" 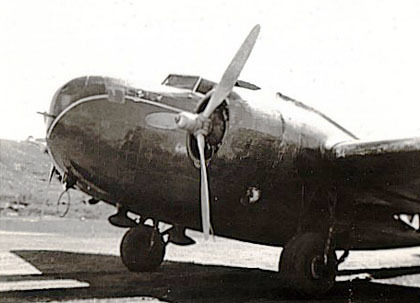 Douglas B-18; this old plane brought the heating oil out to the site, it was flown by a civilian contractor. 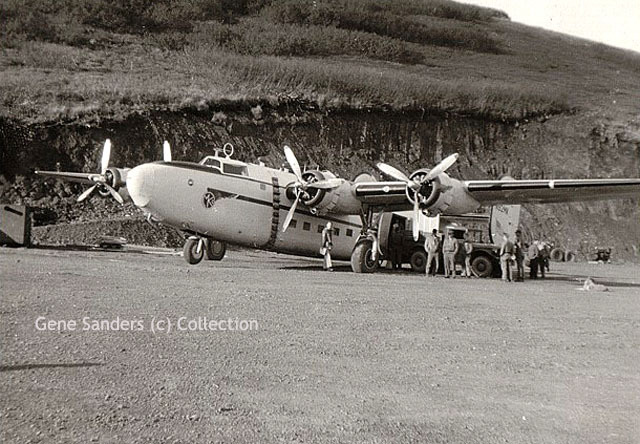 B-24, actually identified as an L30, owned by Morris-Knudsen Constructions Co.
C-119 wreck; much more of the C-119 at that time laying beside the SVW runway, seemed to have been bulldozed off the strip (as was the C-47). Sparrevohn tent city, where the civilians lived. I can't imagine living on those tents at Sparrevohn in the winter. 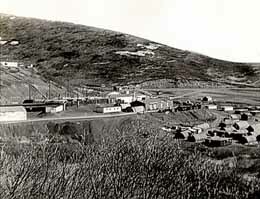 This photo is of the old original road from lower camp to the hilltop, where the radar facility was. 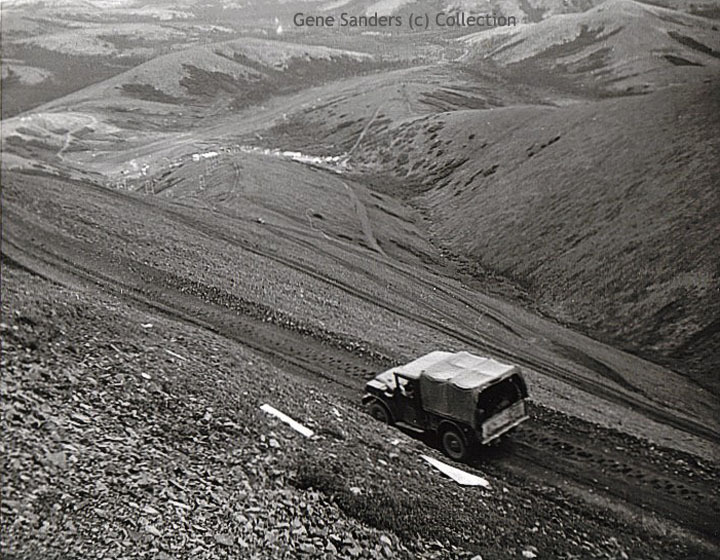 This road is now abandoned for a different round, but as you can see beyond this weapons carrier vehicle, that the road switchbacked back and forth and it was a very dangerous road; it was very narrow and the trucks were 6-bys carrying water up to hilltop; imagine making the switchbacks with snow and ice! If you go on Google Earth you can see lines on the hillside where this old road used to be! There was also a tramway, which ran straight up the mountain, from lower camp to hill top, however it usually had some problem and was often out of use. 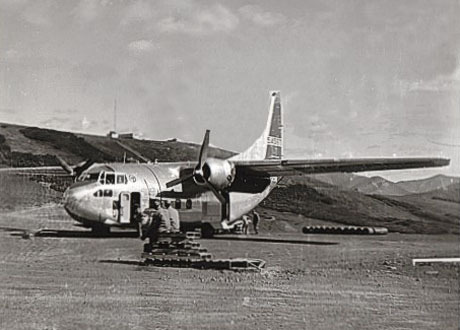 C-123 Provider, typical of the cargo aircraft used by the Air Force in Alaska at that time, for carrying men and supplies to the many DEW-line radar sites all over Alaska the C-47 was being used less and less at that time. 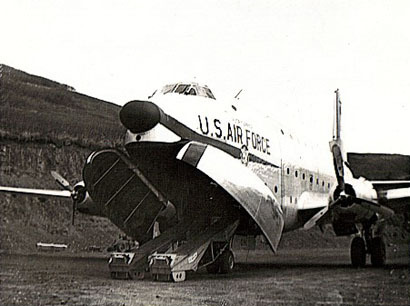 C-124, parked on the flightline at SVW. 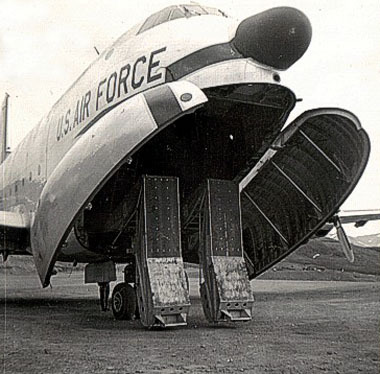 It was always an experience to watch a huge C-124 coming in at Sparrevohn, the sheer size of that aircraft on a gravel, narrow runway..! 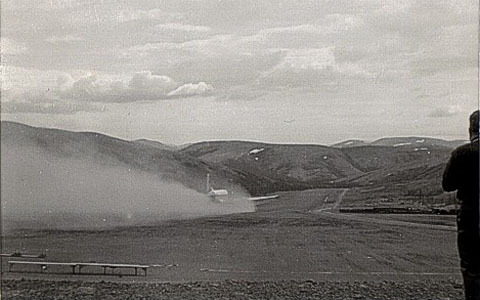 The runway was relatively flat at the lower end but went uphill, which required applying full power to get up to the flightline. I always had great admiration for one particular pilot, a Captain, who was able to drop that big plane in there like he had been doing it a thousand times! He was able to bring that plane in right up onto the flightline, turn it on a dime and off load and then get the heck out of there; that guy was always all over his airplane and he was "THE BOSS", clearly in command, knew what he wanted and was an artist in his flying abilities. I've always wished I could talk to him and reminisce with him of those days. 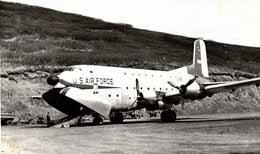 Had the absolute best time of my life flying C-124 with the 4th, from 1957 thru 1964. 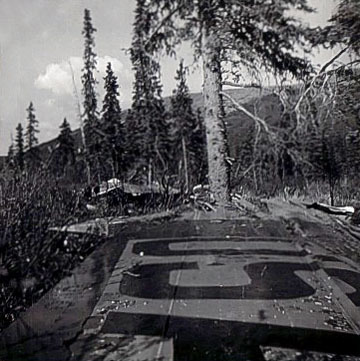 I had the honor of being on extended TDY at Elmendorf AFB, on Operation Shoehorn, when we squeezed "Charley One-Two-Fer" in too many support runways at Dewline Sites scattered throughout Alaska!! Needless to say, Sparrevohn was not a 'piece-of-cake', but definitely was a 'fun-challenge'..."
Location of Sparrevohn (PASV) in Alaska. "Thanks for the very interesting webpage about Sparrevohn. I am an old Air force weatherman and worked for RCA after separation from the Air Force. 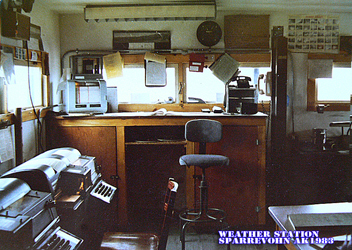 I was at Sparrevohn from 1980-1986, for a total of six years as a contract weatherman for RCA. From the pictures on your website, it looks like it changed little from the time that you were there! 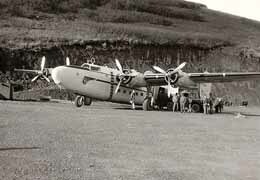 The weather station can be seen in one of the photos, behind the C-123 sitting on the ramp. It's the building on the hill right at the base of the Omni directional navigation antenna. Six years is a long time to spend at one of those sites... We had 2 weeks vacation every 3 months and that made it almost bearable. Still, I had dreams, almost nightmares (like being stuck there all alone without being able to get out, or a variation on that theme ), at least every few months for probably 4 or so years after I left ! Here are some pictures that I took of the weather station and some regular visitors I had while I was there." 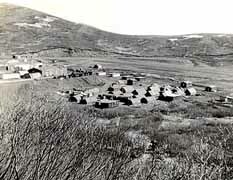 "I went on a hunch tonight and started looking for any information on Sparrevohn AFS, Alaska. I was stationed there in 1972 when the radar station was still in service. It brings back all the memories of the switchback road and the tram (that never worked at full capacity). My room was at the end of the barracks where it landed at top camp. I was a radar technician and was on site from May 1972 to Nay 1973. That runway was a trip." 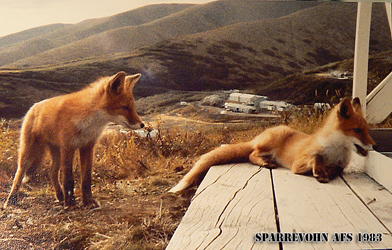 "I was there at Sparrevohn from July 1958 to July 1958, I believe. It was quite an experience and I only can thank my "lucky stars" that I was 19 and could deal with it! 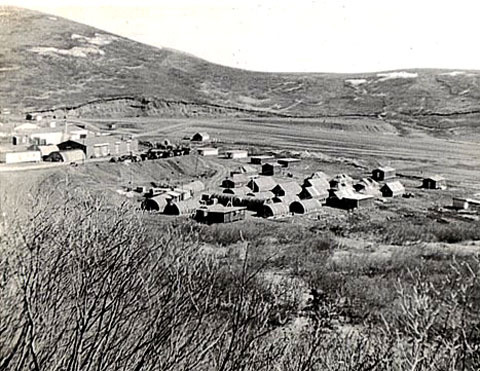 We still had the tarpaper barracks on the hill with the roofs that blew up in the winter and the snow blew in on top of us... They were just starting to build the new building and water tank when I left for the Lower 48. It's great to know that it is still functioning." Hello to Gene Sanders and everyone (military and civilian) who served at Sparrevohn Air Force Station past and present. 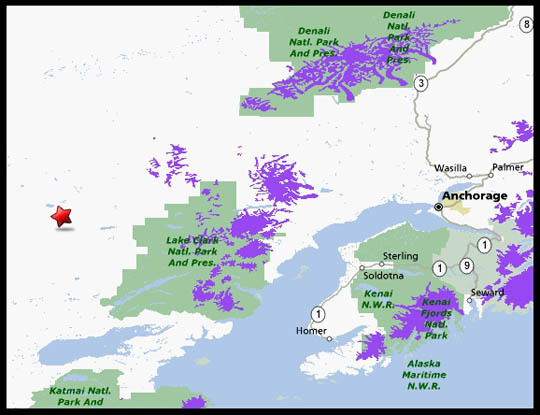 We have an All-Alaska Radar Site Yahoo Group which invites new members to come and share their stories about their tour(s) at any of the Alaska Radar Sites from Day 1 up to the present time. and click on "Join this Group." Let me know that you served at Sparrevohn and I will admit you to our Group. 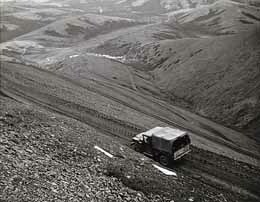 We have photo folders of all the sites and we tell stories about our days in Alaska. We are the "last" of the breed of folks who served at USAF radar sites in Alaska and maybe you will meet up with someone whom you served with at our Group. The group is called Cold Bay because that is the site that "I" served at. However, membership is open for folks who served at all the sites. We are just the host site.